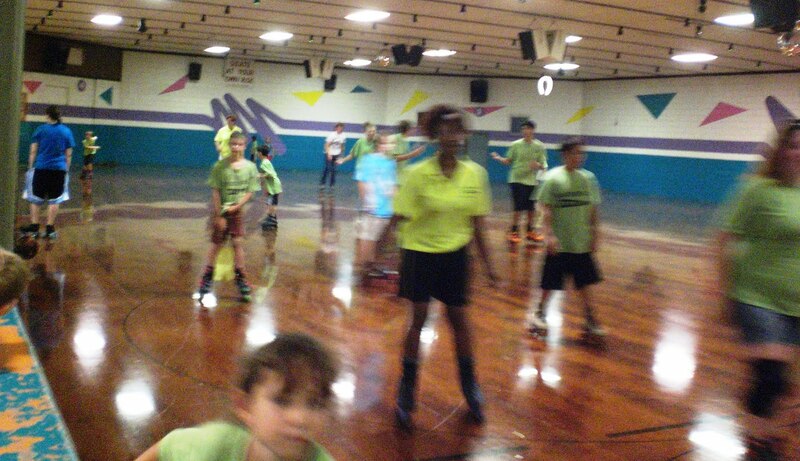 Another field trip we took was to a roller skating rink. We must have gotten a really good deal, since we drove nearly an hour to get to the Frenchtown roller rink... when there are quite a few in between. Apparently they've had a couple championship speed skating teams, so there were some neat photos on the walls in one area. The rink was old (and wooden), and they're renting out part of their parking lot to a tubing company (that takes people to the Delaware River to go tubing). There's a little window where you pay, then you walk straight in. There are no lockers. There is a snack bar, a seating area, and an arcade. There are benches to sit on while you put on your skates. There was, however, only one person working behind the skate window the majority of the time, so getting all of the kids through took some time. It's mainly a quads place (aka rollerskates), but for $1.50 more you could rent inlines. I paid the difference and was given a pair of 8s that were too big (I take an 8.5 in skates), so I swapped for a pair of 7s that were very tight. No half sizes, and the skates had no padding, so your foot was up against plastic everywhere, making for crushed toes pretty quickly. The buckles were also in terrible shape, and at least three out of my six were stripped. I made do, but wasn't very happy about the situation. I was surprised at how many kids had NEVER skated before. And not just the kids, but counselors, too! The summers of 1998 & 1999 were solid skating for me... that's just what we did as high schoolers. And when we were younger, at least one person a year had a birthday party at a skating rink! A couple of us who knew what we were doing made it a mission to get each of the kids around the rink at least once. This was working great for a while, but the problem was too many of them were giving up within half an hour, before one of us could get to them. This was complicated by the fact that the non-skating counselors weren't always being encouraging to the children. Either way, I was able to pry quite a few off the wall, and delighted in the fact that I was able to help a few others understand how it works (we had a few who just tried to scoot back and forth, not realizing how angles, weight balance, etc. affected movement). Like the past couple trips, most of my photos have children in them. However, because of the lighting and movement at the skating rink, I have one that's blurry enough to not really reveal anyone yet clear enough that you can get an idea of the age of the rink (just look at the wall design!) After skating for a couple of hours, we packed up and drove to a park so we could eat our lunches. I wasn't a big fan of the idea of leaving my sandwich and fruit on a bus in 90-degree weather, so I packed a muffin and some cheez-its that day, LoL. The park was Bulls Island Recreation Area, and I wasn't really impressed. It probably would have been nice for walks or a couple spending the day together or something, but for kids it wasn't ideal. The playground was pretty small, so we didn't utilize it. There were some picnic tables (enough for everyone to sit down), but there were no trash cans. Apparently NJ is doing this thing to encourage people to bring their trash out with them (cutting the jobs of those who empty the trash in the meantime). Except children don't carry trash. And for those with brown paper sacks, you weren't going to convince them to keep lugging their beat-up and torn bags (those things get so mangled in just a few hours!). Regardless, we ate peacefully and with a nice breeze, then boarded the buses for a long ride back to camp. I will spare you the shenanigans that took place on the way, but for those who know me well, ask and I'll tell you.